Murphy Neal Jones. A really wonderful man. The SI article starts on pp 77/78 of below. It is a little hard to read but well worth the effort. 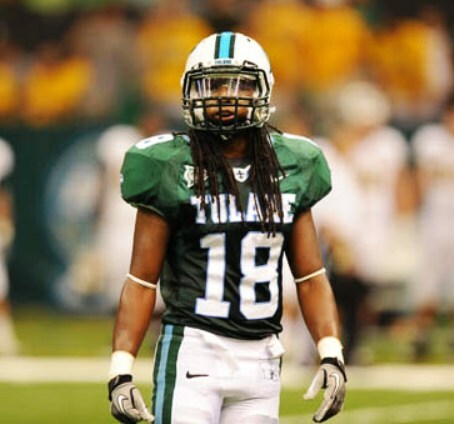 Awesome man and awesome representative of Tulane football. Sorry to her of hispassing. A true Hero. Colonel Jones was a huge inspiration to those of us Tulane Air Force Cadets in the mid seventies. Amid all the animosity and recriminations of those years towards the military, Colonel Jones never did anything except embrace each day, each person he met, and each challenge to help others. Our University and our Nation are diminished by his passing. Fair Skies and Following Winds, Murphy Neal Jones. it is really too bad the school hasn't done more to honor him. I had never heard of him until now. He has been introduced and recognized at many Tulane athletic events over the years. Agree. The three services ROTC units have made small but significant contributions in service to the nation. I know that the start of the Navy ROTC unit was to quickly train pilots for WWII, called VF training. If you walk into the Navy building.the old gym floor you are walking on was the home of scores of cots where the young men slept while they rushed them through training and off to war. I had only heard of him a couple of times, but they were via this site having links to game events where he was being honored. Tulane wholly embraced Neal Jones in every way imaginable. I never saw him during those years he was with the Athletic Department, but it seems that was the center of his life. There at that moment in 1975, two years out of the Hanoi Hilton, that he came and spoke to us, that my outlook and perspective on life was forever altered for the good. He just brimmed with happiness and kindness, and he was all Fighter Pilot in confidence. I will make every effort to be there at Arlington when his country pays its final respects. i was in school in the early to mid 2000's and don't remember hearing about him. maybe he was still being celebrated at that time but i don't remember anything about him. Cowen was an Army Infantry Officer. Great read on that article. Although I think I might need glasses now. It's like a time capsule with OJ and Nixon references, the ads, and building the frustration before we actually beat LSU. I'm with Yankee, time-wise, so I had never heard this story. Thanks for posting.